Columba is a final year music student at the university, holding an instrumental scholarship. She is delighted to be both SUSO’s Leader and Librarian this year, as well as the Leader and President of Sinfonietta, the auditioned chamber orchestra. Complementing her violin studies as a keen pianist and conductor, Columba is specialising in performance this year. Last year, she was a choral scholar and a member of the Cantores Michaelis choir. 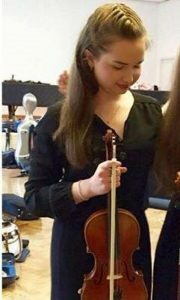 Columba studied at the Royal College of Music Junior Department, London for 7 years, and was a member of the National Youth Chamber Orchestra of Great Britain, which she lead in 2017. In 2016, she was also a member of the BBC Proms Youth Ensemble, performing with the BBC Symphony Orchestra in the Last Night of the Proms at the Royal Albert Hall. In addition, Columba has also performed with other prestigious orchestras, including the Amadeus Orchestra alongside soloists such as Raphael Wallfisch.